39 pounds so it's light enough for anyone to easily lift and transport. So light and compact it can even be used for spotting. cleaning in a deceptively light and compact package. for compact storage almost anywhere and easily adjust to operator height. making filling and emptying incredible easy. The results - no spills or mess. self-adjusting, self-leveling cylindrical brush eliminates manual adjustment, consistently cleans uneven floors and carpet. Large 7 inch wheels for maneuverability. Vac shoe made of a sophisticated and durable engineering plastic. Vac Motor 2HP 112 CFM 106in. 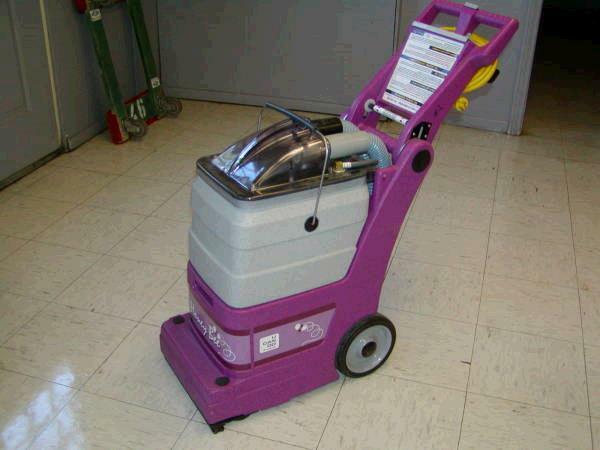 * Please call us with any questions about our carpet cleaner rentals in Lake Charles and Moss Bluff LA.